WHAT IS THE LASER ELIMINATION OF UNWANTED HAIR? It´s a technology or medical device that emits energy through a handpiece. This energy is absorbed by the hair root that is progressively weakened until its disappearance. The target of this laser diode energy are stem cells that have hair root melanin (dark pigment) and microcapillaries that nourish each hair. If hair has no melanin (blond or gray hair) hair will not be destroyed because it does not absorb energy. 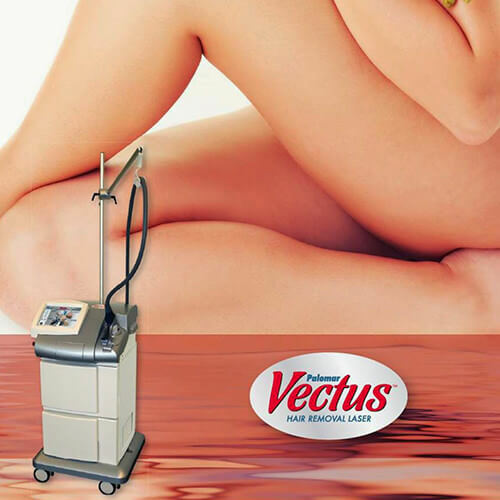 Vectus is a laser diode manufactured by Cynosure (business leader) that has proven highly effective in obtaining a very significant reduction of unwanted hair. It can shave any type of skin in relation to skin type, even mixed or black skin. They are needed from 6 to 12 sessions to guarantee results. It´s necessary to note that when the skin is tanned after sun exposure the treatment can´t be performed since energy will be absorbed by the melanin in the epidermis and can cause hypopigmentation problems. We have to wait two weeks for treatment, when the skin surface melanin disappears. To find out if there is a high rate of melanin for tanning the equipment has a melanin melanin (Skintel).